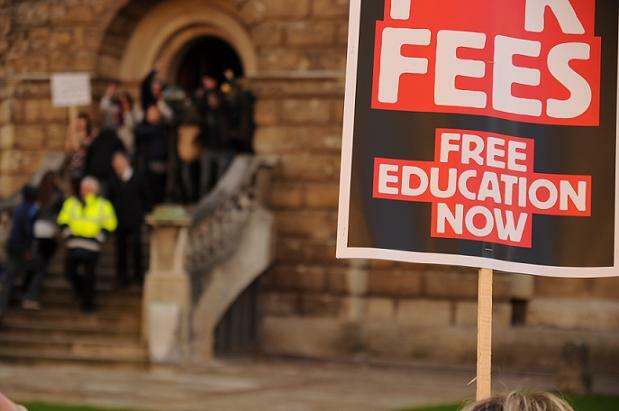 Protesters gathered in central Oxford today as part of a nationwide day of action against the much-discussed proposed cuts to education funding. As they approached the Radcliffe, a circular library surrounded by a path, the chanting grew louder and more insistent. A bassy soundsystem was wheeled around. People danced and cheered, circling the building, growing in number. The police looked uncomfortable. The Radcliffe is dim and very quiet inside, lit by desk lamps and elaborately grilled windows set in niches, with soft lamps reaching up a vaulted stone ceiling. As the sounds of the protest began to trickle in, bleary-eyed readers inside put down their books and gathered at the windows. And then they came. A rush over the fence and across the grassy moat surrounding the library and people streamed in, yelling, laughing, cheering. Many inside tried valiantly to keep reading, even while scores turned to hundreds and students climbed onto bookcases chanting and laughing and dancing, even while the soundsystem brought dubstep into the stuffy room, even while people clambered onto desks, clapping, whooping – throughout, there were those who stared intently at their work, refusing to look up. Eventually, when the doors are closed, they do look up – to a radically different space, heaving with young people. The soundsystem is switched off and the meeting begins. ‘If everyone’s happy, we’re going to secure the doors.’ Murmurs of agreement. ‘Are you staying for the lock-in?’ says a girl in a red scarf to her friend. ‘An alternative to shutting the door,’ offers someone, ‘would be for a group of people to take responsibility for guarding the door.’ Hands wave in acquiescence. ‘Can we trust those who have taken photographs to blur out people’s faces?’ A discussion ensues. ‘There shouldn’t be people taking pictures.’ ‘It’s too late for that now,’ someone responds. The police ask to enter. They are refused. There is a long meeting on demands. The process is consensual and participatory – people discuss by raising hands, others respond, someone makes a proposal, and there is a check for consensus. There’s no voting, no leaders, no central committee, no chair. This is now the established model of political organising: drawn from movements in the South, developed in Climate Camp and waves of university occupations, worked over in countless hours of meetings in fields and lecture halls. It is now the way young people expect to do things. The contrast with the drudgery and dripping, layered hierarchy of institutional politics could hardly be more stark. ‘We should stand in solidarity with anyone affected by the cuts,’ suggests someone. People aren’t supposed to applaud, but they can’t help themselves. A librarian wryly smiles. How will this end? No one knows, but it’s hard not to think that a rigorous, scientific assessment of this – taking into account the costs, the risks, the possible benefits – would be missing the point. Just don’t bother trying to explain that to the police outside. 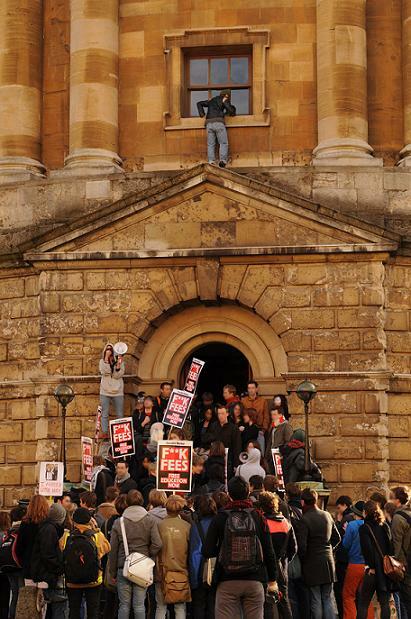 Musab Younis, reporting from occupied Radicliffe Camera, University of Oxford. This is fantastic, the solidarity that has been witnessed today from students across the country is just phenomenal and shows that we can truly turn this around. I just wanted to say that I think this is a brilliantly written article. Well done! Thank you for this insight, Musab. The protesters actions are brave and deeply commendable. Wishing you all the very best of luck.